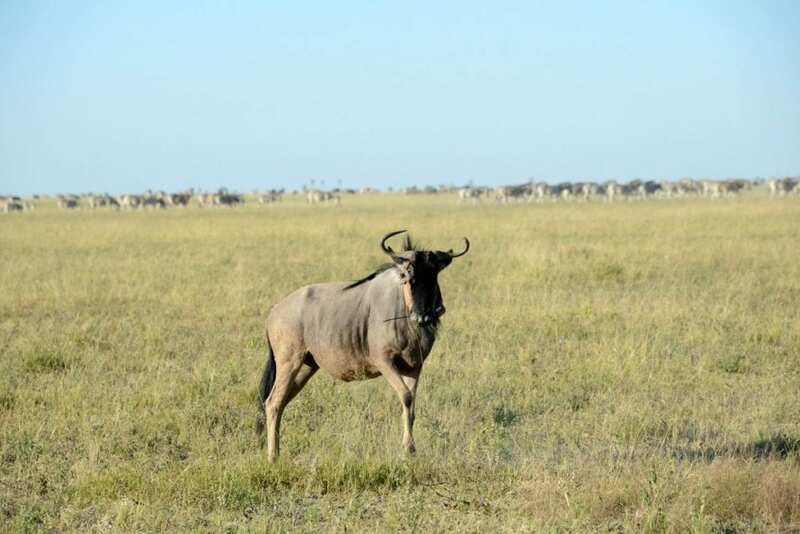 A wildebeest’s muscles are two-and-a-half times more powerful than a car engine, according to new research. It is the secret to its epic annual trek when around 1.5 million of them migrate across Africa in search of grazing and water. Dubbed ‘The Greatest Show on Earth’, the annual spectacle draws thousands of tourists to Kenya and the Serengeti National Park in Tanzania annually – fuelling a multi million pound industry. Now a British team has discovered wildebeest can travel up to 50 miles over five days – without drinking. A human can die in three days without water. 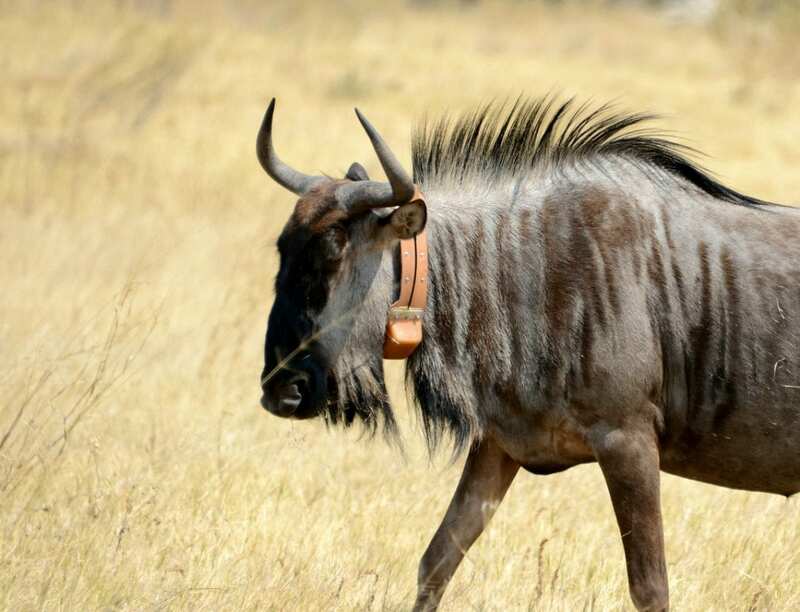 The wildebeest converts two-thirds of energy into work – and waste only a third as heat. That is substantially more efficient than both comparably sized animals such as cows – and small creatures like rabbits. And it’s all down to the wildebeest’s remarkable muscles – that prevent it overheating. The strong fibres have a uniquely high efficiency rate of 62.6 per cent. In other words, almost two-thirds of the energy used is work in the form of movement – rather than as wasteful heat. To put that in perspective, most animal muscles – and even a car engine – manage only 25 per cent efficiency. Study corresponding author Professor Alan Wilson says the findings have implications for global warming. He said: “Wildebeest live on a nutritional and thermo-regulatory knife-edge which could see them severely affected by climate change. “This muscle efficiency minimises heat produced by the wildebeest – which suggests they lose less water through frequent exhaling and so need to drink less frequently. It is the first time the energetic measurements of muscle fibres of large mammals have been measured. The findings, published in the journal Nature, shed light on how animals living in desert environments can cope with seasonal and local variations in rainfall, food – and climate. An animal’s capacity for long-distance travel is dependent on their energy utilisation and heat production when moving. Large ones are more efficient at this overland than smaller species – but the efficiency of individual muscle fibres is less understood. In mice it’s known that a third of the energy is translated into movement while the other two-thirds are expended as heat. The direct study of living muscle fibres is difficult, even for small animals, and it hasn’t been attempted for anything larger than a rabbit. The team travelled to Botswana to uncover how the wildebeest is famously able to undertake long-range travel in arid conditions – with little to no food or water. Prof Wilson, of the Royal Veterinary College’s Structure & Motion Laboratory, said: “We were surprised to discover just how energy-efficient their muscles are. In the Makgadikgadi National Park there is only one water source in the dry season – the Boteti river. But the best grazing grounds are located nearly 10 to 20 miles (15-30km) away. 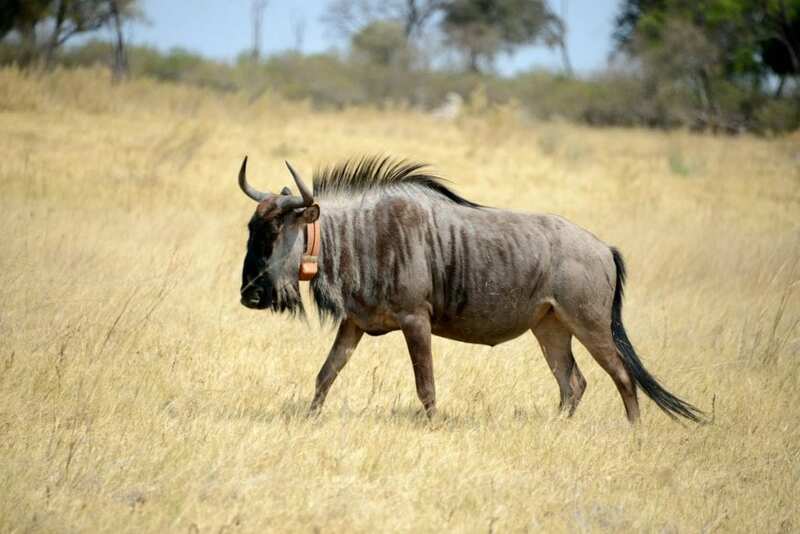 So the researchers attached GPS tracking collars equipped with environmental sensors to 20 blue wildebeest to determine how they tackle this challenge. Tiny muscle samples – less than 1mm across and 10mm long – were also taken from the sedated wildebeest and electrically stimulated to assess the efficiency of the muscle. The collars collected data covering 18 months in the wildebeest’s life. This showed wildebeest can go up to five days between visits to the river and walk up to 50 miles (80km) in that period. This enables them to spend most of their time eating the high-quality grass. Their strikingly high muscle efficiency rate plays the essential role. The study found the wildebeest continued this behaviour – even when the daily temperature exceeded 40 degrees Celsius (104F). In these conditions the wildebeest must sweat or pant to lose the heat created by locomotion – losing water in the process. Having more efficient muscles means less heat is produced and the wildebeest can conserve water – enabling them to last longer before having to drink again. Prof Wilson said: “Carrying out complex laboratory measurements on wildebeest muscles in the African savannah was a physically challenging and technically complex task that produced striking findings. “It was not known that wildebeest can travel for such long distances through hot regions without access to water. He added: “The tortoise is more efficient – in terms of cost of transport or energy to move per pound of body weight. A wildebeest can grow to eight feet (2.4 metres) in length and weigh up to 600lbs (270 kgs. Wildebeest typically inhabit the Serengeti plains of southeastern Africa. For most of their lives the graze in the grassy savannas and open woodlands of the plains which straddle Tanzania and Kenya. The search for greener pastures does not come without danger. Its migration route crosses many rivers – most filled with giant Nile crocodiles.